The prevailing wisdom in the wake of the Kris Letang suspension was that Pittsburgh had little chance to win Game 4. The Penguins were predetermined to be headed back to Washington with the series tied 2-2, with their defense completely incapable of handling the load without #58 in the lineup. But without their most irreplaceable player, the Pens flipped the script and won the game 3-2 in overtime off Patric Hornqvist's game winner. It was a resiliency they've shown all year long under Mike Sullivan, and the team rallied around the loss of their star blueliner. 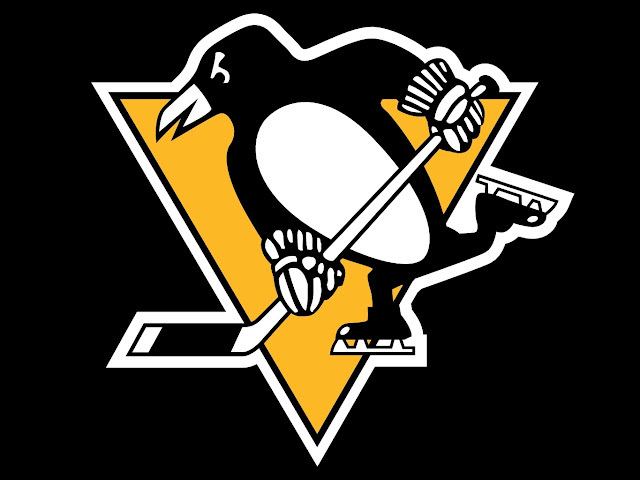 Matt Murray had another strong outing, saving 34 of 36 shots on goal, and Trevor Daley and Matt Cullen also added goals for Pittsburgh. The Caps got on the board early when Jay Beagle chased down a puck in the Pittsburgh zone and swiped at it, chipping it up and over Matt Murray's shoulder and just under the cross bar to give Washington the 1-0 lead. Moments later Evgeni Malkin nearly pulled the Pens even with a great individual effort, but he couldn't connect on a pass with Justin Schultz, and a mad scramble in front of Braden Holtby couldn't put the puck in the net. Pittsburgh would do a better job of generating pressure at the start of Game 4 than they did in Game 3, and that would lead to them tying the game midway through the 1st period when Trevor Daley's shot hit Karl Alzner and slowly trickled through Holtby's five hole as he couldn't recover. It would initially be ruled that Sidney Crosby touched the puck on the way in before being later changed to Daley's goal, but it was still and assist for the captain and his first point of the series after posting 8 points in five games against the Rangers. The period would continue to see the Pens and Caps trade periods of extended time in the other teams' zone, but a Carl Hagelin interference penalty on T.J. Oshie along the boards as the puck flew by gave the Capitals their first power play of the game. The Pens would kill it off, and Hagelin would be sprung on the breakaway after leaving the box. Matt Niskanen would take a hooking penalty trying to slow him down, and as Hagelin drove the net there was a scary moment as Dmitri Orlov check Hagelin into Holtby, sending Hagelin flipping over the goaltender. Both players would be down on the ice for a few seconds before getting up. The Pens would go on the power play with Niskanen receiving the only penalty, but in what's becoming a bad trend for the home team they took a penalty on the man advantage when Patric Hornqvist tripped Daniel Winnik. They'd play 4-on-4, but the Capitals wouldn't get to enjoy any power play time after Jason Chimera stuck his foot out and tripped Crosby. The Pens would get 6 seconds of a 4-on-3 before Niskanen left the box to even things up for the rest of the period. 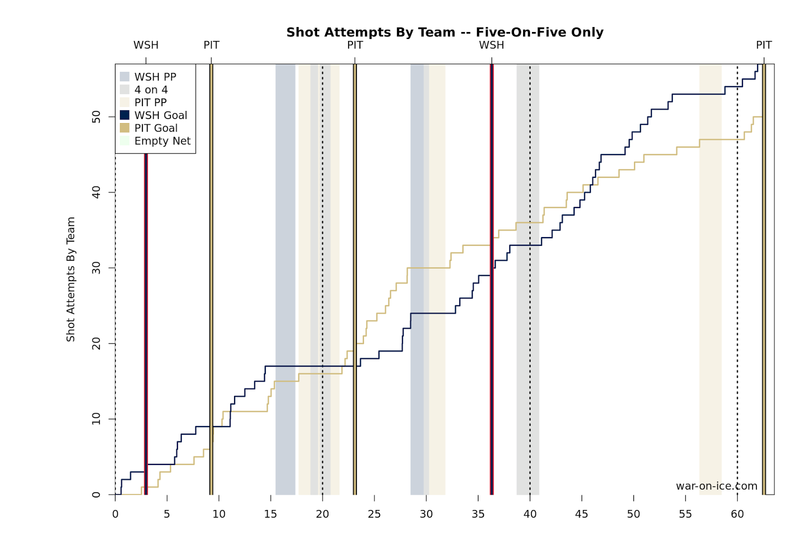 The teams would enter the first intermission tied 1-1, and the 2nd period would begin 4-on-4 before giving Pittsburgh a brief power play which they were unable to do much with. Matt Cullen would put the Pens up 2-1 early in the period after a faceoff at center ice. Tom Kuhnhackl would chip the puck into the Washington zone, and Cullen would track it down and slip it five hole on Holtby. The goal seemed to give the Pens even more jump in their steps, and they had several good chances to pull ahead 3-1 but were unable to do so. The Capitals would have a great chance to pull even midway through the 2nd period when a Washington shot took a big bounce off the end boards, and Ben Lovejoy would be called for hooking Justin Williams to prevent him from putting the puck in the empty net as Murray attempted to recover. However, it would be the Caps turn to take a penalty on the power play after Oshie cross checked Daley behind the Penguins net, but as has been the story of the series so far Washington was able to kill off yet another chance down a man. Unfortunately, Pittsburgh's inability to build upon their lead in the 2nd period would open the door for the Caps to tie things up, and John Carlson did just that when he took a pass on the back door all alone and beat Murray glove high to tie the score 2-2 late in the period. Ian Cole and Tom Wilson would get coincidental roughing penalties with just over a minute remaining in the period, and the teams would play 4-on-4 until the horn sounded to start the second intermission. The 3rd period would start with the Capitals repeatedly driving the play into the Pittsburgh zone, but as he's done for most of the series Matt Murray was able to turn aside several good chances to keep the game tied. The Penguins would get more bad news as Alexander Ovechkin slashed Crosby on the left hand near the boards, and the Penguin captain could be seen heading down the tunnel to the locker room visibly upset. Pittsburgh would have a great chance midway through the 3rd period when Matt Cullen made a great read to pick off a Washington pass in the defensive zone, and after taking the puck up ice he toe-dragged Niskanen and rang a post off the crossbar, barely missing out on put the Pens up in the game. The Penguins would get a power play opportunity late in the period when caught Crosby up high with his stick, but Pittsburgh continued to be completely awful with the man advantage, and they've been lucky that their failure to take advantage of these situations hasn't harmed them more to this point in the series. The game would head to overtime, but unlike in Game 1 it would be the Pens leaving the ice victorious. Just minutes into extra time, Mike Weber pushed a loose puck out from in front of the net, right to Hornqvist in the right circle, and he beat Hotbly to move the Pens one win away from returning to the Eastern Conference Finals. Even without Kris Letang, the Penguins were able to do much better in the possession game than they did in Game 3, when they went into a defensive shell after getting a two goal lead and were lucky to hang on for the win. They still didn't win the battle on the night, finishing with a score-adjusted 46.1 CF%, but it was an encouraging results for a team missing a defender who had played over 30 minutes on average in the first three games. The win gives Pittsburgh a chance to end things when the series returns to Washington Saturday night for Game 5, and they'll hope to build off tonight's game when they insert Letang back into the lineup.